Weddings in Tenerife - how can you get married on the island? Tenerife is known as the island of the eternal spring, with great weather all year round, so it's not a surprise that many couples dream of joining their destinies over here. And since you're already on a romantic island in the middle of the Atlantic ocean, you can consider it as your honeymoon also and your guests can spend an extra few days as well, making it a proper holiday abroad. Getting married in Tenerife legally - is it possible? Unless you and your partner are long term legal residents of Spain, you cannot get married legally in Tenerife. If just one of the partners is of Spanish nationality or resident in Spain, it is advisable to consult the necessary requirements at the corresponding consulate in Spain. The best thing to do is to get married legally in your home country and then pop over to Tenerife to hold the wedding reception and a blessing ceremony. It's also possible to have a religious wedding ceremony in Tenerife, but you will need proof of baptism and other documents to be allowed to proceed. Our advice is to contact a good wedding planner in Tenerife, that can guide you in regards to the papers you may need, since it's not a very standard procedure. Most of the people who have a religious wedding ceremony in Tenerife are of Catholic faith (since Spain is a Catholic country), but a wedding planner might be able to help organize ceremonies for other faiths as well. There are lots of venues and hotels that offer wedding packages in Tenerife, so you won't have a problem finding the perfect place to organize your ceremony. Some of the most romantic hotels in Tenerife are located in the south, where the weather is great all year round and you can host an outdoor ceremony if you'd like. In the end, the main reason why you've chosen Tenerife for a destination wedding is the location, landscapes and great weather, so you should take advantage of all the things the island has to offer. All these luxury hotels offer special packages for weddings and have their own wedding coordinator or company that they work with, so you can contact them directly for more information. as we've said, it's not easy to get marriend legally in Tenerife, so realistically you should be thinking of hosting here just the wedding reception and a blessing ceremony. 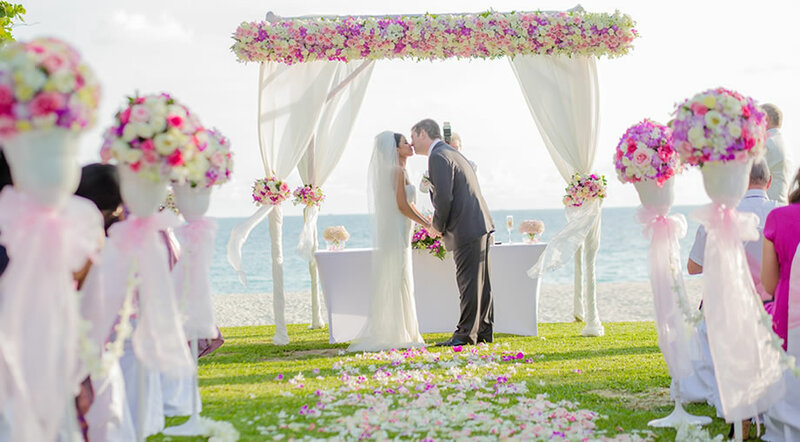 Blessing ceremonies are not legally binding, they are just a nice and romantic event where the couple can confess their love for one another. If you are already married and you simply would like to renew your vows, hosting a blessing ceremony in Tenerife is also a great and popular idea, that many couples opt for. If all you want is a blessing, you should contact a specialized company that can help you with the location in order to set it up. Depending on what you desire and how many guests you have, the blessing ceremony should be also less expensive than a wedding reception. Beaches in Spain are considered public spaces, so getting married on the beach is not easy, since a wedding is considered to be a private event. It's no surprise that you'd like to celebrate your wedding in Tenerife on the beach, but at first you should contact the local authorities to ask about the legal requirements, or ask your wedding planner to do it for you. The Canary Islands have started recently accepting beach weddings, following the example put forward by Barcelona with the beach of Castelldefels for example. The first step is to contact the Provincial Coastal Demarcation (Demarcacion Provincial de Costas) in order to obtain your permit, which should state how much space on the beach you will need, the number of guests and what you plan to do in terms of decoration. Since all beaches in Spain are considered public spaces, the authorities have to make sure that your ceremony will not bother other people that may be on the beach that day. Also, considering the fact that temperatures can rise above 35 Celsius during the summer days, ceremonies are usually scheduled for the late hours of the afternoon, when the temperatures are milder and also there are less people present on the beach, that might gather around the participants in the ceremony. The second step is to contact the City Council or Town Hall of the municipality where you intend to get married. Third step is to contact the Ministry of Territorial Policy of the Government of the Canary Islands (Consejeria de Politica Territorial del Gobierno de Canarias). One of the nicest beaches in Tenerife where you can get married is Playa de las Teresitas, the only beach with golden sand in the north of the island. Taxes for obtaining a permit to get married on Las Teresitas beach are around 40 - 50 euros for 100 guests, that is if you estimate you will need around 200 square meters. There's also a deposit of around 300 euros that will be returned to you, if the event goes as planned and the beach is not damaged in any way. For a ceremony on Las Teresitas beach you should contact Servicio Provincial de Costas, situated on la Rambla de Santa Cruz, no. 169 in Santa Cruz de Tenerife.